Mangalore has several great restaurants... but growing up there I never really ventured to restaurants except those with friends. This post is more a round-up of my favourite dishes from several different restaurants. While Hao Hao the Chinese restaurant remains my all time and I did pig out from here twice, I didn't wait long enough to take photographs of the food. Suffice to say that I had two mind blowing meals from there which consisted of a range of Mixed fried noodles and rice, sweet and sour pork, roast pork and Hot garlic chicken. 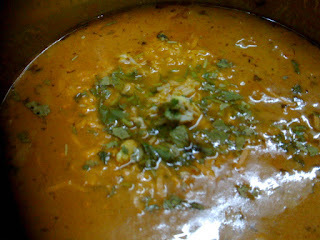 Next in my list of favourites is the butter chicken and naan from Mangala. You give them the vessel and order chicken by halves or fulls. 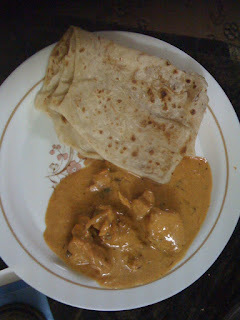 A full butter chicken with six naans comes to 400 bucks which is ample for three hearty meals for three adults. The dish comes topped with shavings of butter and the gravy is nice and thick while the chicken is soft and succulent. Ummmmm! am making my own mouth water. Next comes the variety of thalis available in Mangalore. Of course I don't claim to have tried all of them, but here is a sampling. Coconut Grove (with no connections whatsoever with the Bangalore chain) has interesting set thalis of fish and chicken. 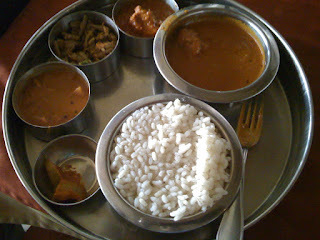 On one visit, I opted for the chicken thali and mom and dad went in for the fish thali. 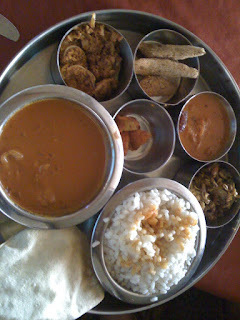 The fish thali comes with the fish fry of the day and a fish curry. Also with it are a sambhar, vegetable and pickle. On this particular day, the dry item were Kube Sukka, or cockle shell sukka. The gravy was of the small variety of fish which mom tells me I was a major fan of as a child. The chicken thali came with the same options but in poultry. And so I had a chicken sukka and a chicken gravy which had a healthy infusion of coconut milk. 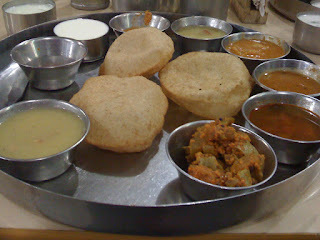 If you are a vegetarian and would like to enjoy a good thali, the Hotel Srinivas is where you should head. This nice airconditioned place has a couple of thalis on offer and I opted for the simple South Indian thali. The rest of them come with soup (which I feel has no place in a thali meal) and ice-cream (which I am sure many would like included in all meal options. The food served was hot and good and the rice of generous quantities. The rice course is preceded by puris or chapathis. The meal ends with a sweet, more often than not a payasam. 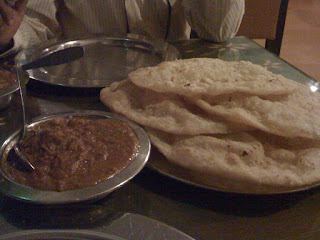 Another restaurant that we went to was the Punjabi Dhaba. I was under the impression that this would be more on the lines of a Rajasthani, Gujarathi, Punjabi theme. But it turned out to be a glorified Shanthi Sagar menu with everything under the sun on it. On recommendation I opted for the Channa Batura and I must say I have never seen Bhaturas that big. Safe to say that each Bhatura was the size of a regular eating plate and each order of Channa Bhatura comes with two puris. The channa was steaming hot and soft, just the way I like it. And this was washed down with some good, heavy duty lassi.